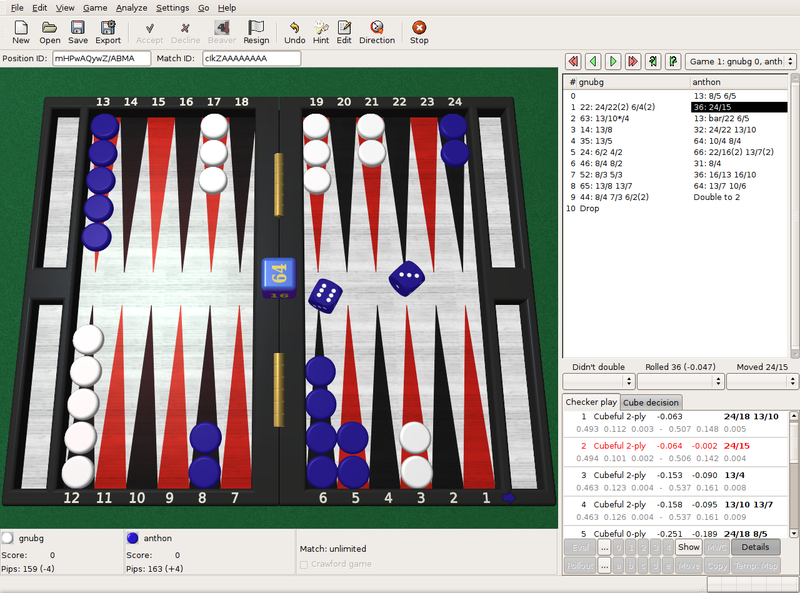 GNU Backgammon (gnubg) spielt und analysiert Backgammon Spiele und Turniere. Das Programm befindet sich in Entwicklung. Bis jetzt kann es sowohl einzelne Partien als auch ganze Turniere spielen und auswerten, Stellungen bewerten, tune its own evaluation functions using either TD or supervised training, Spieldatenbanken für Training und andere Zwecke verwalten. Im folgenden Abschnitt findest du eine vollständigere Liste. It is driven by a command-line interface, and displays an ASCII rendition of a board on text-only terminals, but also allows the user to play games and manipulate positions with a GTK+ board window (png 117k) where available. It is extensible on platforms which support Guile and/or Python. Gegenwärtig spielt es auf dem Niveau eines erfahrenen Turnierspielers (abhängig von den gewählten Parametern und dem Glück im laufenden Spiel, hat es im FIBS -First Internet Backgammon Server - ein Rating von etwa 2000 und findet sich unter den Top 5 von über 6000 hier gelisteten Spielern) und es verbessert sich schrittweise weiter; es sollte etwas stärker sein, als zu dem Zeitpunkt an dem es veröffentlicht wurde. GNU Backgammon kann auf vielen Backgammon Servern im Internetgespielt werden (es ist nur fraglich wie!). komplette Spiele (Match) und Einzelspiele gegen GNU Backgammon spielen lässt. * Support for either a GTK+ interface with a graphical board window, or a rough ASCII representation of a board on text terminals. For the GTK+ interface both 2D and 3D graphics are available. * Functions to generate legal moves and evaluate positions at varying search depths. * Neural net functions for giving cubeless evaluations of all other contact and race positions. * Support for both 1-sided and 2-sided bearoff databases: 1-sided bearoff database for 15 chequers on the first 6 points and optional 2-sided database kept in memory. Optional larger 1-sided and 2-sided databases stored on disk. * Automated rollouts of positions, with lookahead and race variance reduction where appropriate. Rollouts may also be extended. * Both TD(0) and supervised training of neural net weights. * Position databases for supervised training (if GNU dbm is available). * Loading and saving .sgf games and matches (.sgf files are in the Smart Game Format). * Exporting games and matches to HTML, LaTeX, .mat, PDF, PNG, PostScript and plain text formats. * Importing .bkg, .mat, .pos, .sgg, .tmg and FIBS "oldmoves" files. * Scripting ability (if GNU Guile or Python is available). * Automatic and manual annotation (analysis and commentary) of games and matches. * Record keeping of statistics of players in games and matches (both native inside GNU Backgammon and externally using relational databases and Python). GNU Backgammon wurde unter der GNU General Public License (GPL) entwickelt und ist Teil des GNU-Projektes. Wenn du mehr über GPL und die Free Software Foundation wissen möchtest, kannst du die FSF website.